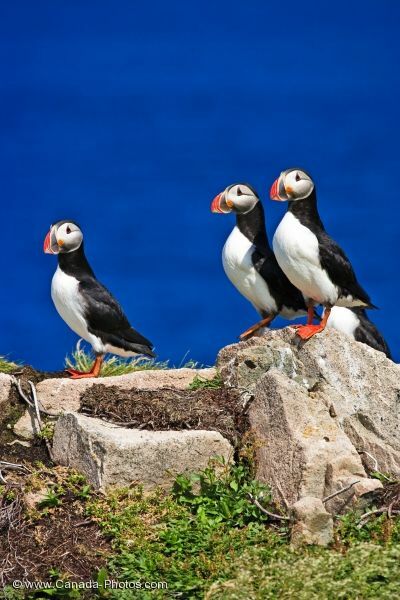 Three Atlantic Puffins stand proudly atop Bird Island in Bonavista Bay in Newfoundland, Canada where they come for about four or five months every year to breed. These Atlantic Puffins return to Bird Island around the middle of April and spend more time on land than they do throughout the rest of the year, but they still find the sea their favorite place even during the breeding season. Picture of three Atlantic Puffins overlooking the water of Bonavista Bay in Newfoundland, Canada.